How to “theatre up” your Pumpkin! There’s just one problem. They’ve forgotten to cast any actors. 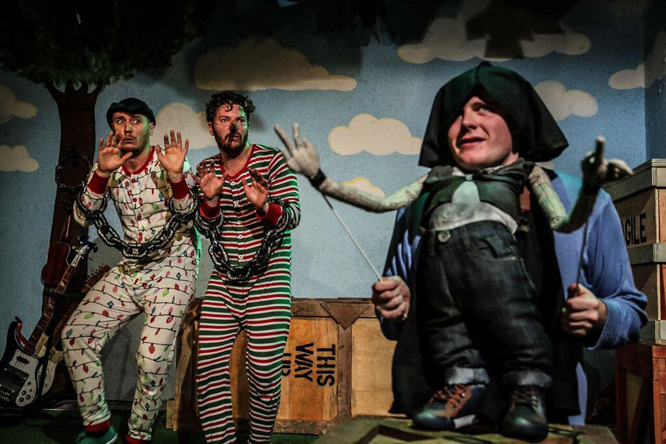 When award-winning comedy trio Sleeping Trees brought their unique brand of slapstick comedy to Battersea’s Latchmere last year, they sold out with their fast, furious and madcap humour. 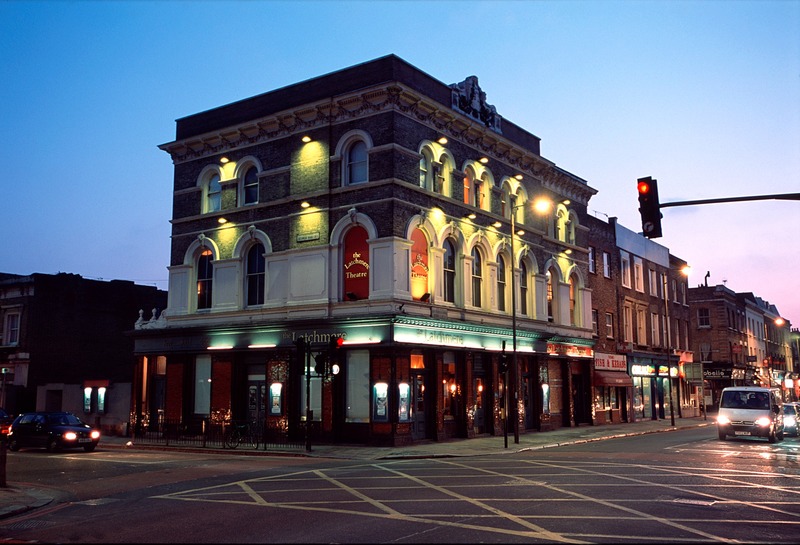 Now James Dunnell-Smith, Joshua George Smith and John Woodburn return, jumping from character to character with a seemingly supernatural elasticity. Sleeping Trees comes from a tradition of anarchic buffoonery – but don’t let that fool you – it’s all choreographed with military precision. Join Cinderella on her perilous adventure as the scheming Rumpelstiltskin blackmails the would-be princess into retrieving his golden eggs from the top of the beanstalk. Prince Charming, the Fairy Godmother and Jack’s pregnant cow all do their best to get in the way, so the delicious, oversized eggs may not be so easy to reach. Is poor Cinders doomed to spend her life climbing vegetables with just one shoe? If you’re looking to treat the family to a magical Christmas but you fancy a change from the usual celebrity-over-substance, try this gem of a show. Will Scrooge open his heart to the true spirit of Christmas before it’s too late? Find out in the Rose Theatre Kingston’s beautiful production of the Charles Dickens classic. LA SOIRÉE’s heady cocktail of cabaret, new burlesque, circus sideshow and contemporary variety is more potent than ever. 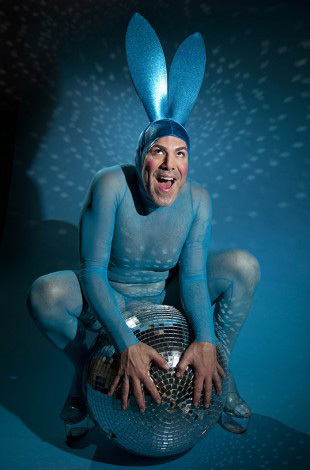 La Soiree’s Blue Bunny…jump to it! A giant green screen, astonishing dance numbers and a cast of extraordinary characters make this ambitious and modern production a hugely satisfying re-telling of Carroll’s masterpiece. Based on Hans Christian Andersen’s classic story, this touching tale of an impoverished young street girl’s hopes and dreams is beautifully told through dance, song and original music performed live on stage. Inspired by Dr. Seuss’s classic tale, The Lorax tells of a moustachioed and cantankerous critter who’s on a mission to protect the earth from the greedy, tree-chopping, Thneed-knitting businessman known only as The Once-ler. Hot on the heels from his sensational sell-out show Infamous, master of the mind Derren Brown returns to London’s Palace Theatre with his most daring magic show yet. Finally…don’t miss the BBC4 broadcast of Gypsy on Sunday 27th Dec. The show was filmed live at the Savoy Theatre, and stars Imelda Staunton and the delightful Gemma Sutton – you can read our interview with Gemma here.